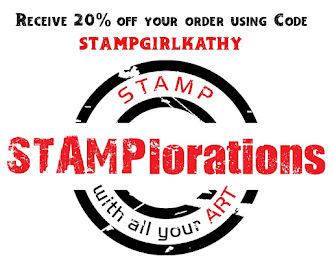 Coffee Loving Cardmarkers is thrilled to be collaborating with STAMPlorations for a super fun blog hop! 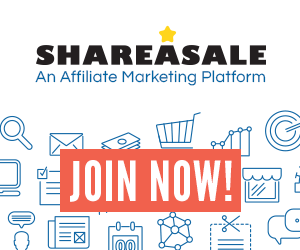 Be sure to stop by each blog - you won't want to miss a single creation by the design team! I'm super excited - being on both Design Teams - to share my projects created with the new STAMPlorations Zen Coffee #2 Cover Plate! For my first card, I used the inlaid die technique. I cut several colors of cardstock with the plate using a dark brown cardstock cut out for the base. I 'colored' in the cut out spaces with the various die cut cardstock colors. Yes, this did take some time, but oh-so-therapeutic for me :) To finish, I cut gold cardstock using the Rise & Grind Phrase Die. My next card was very easy to create. I made a background using a few distress oxide inks. Then, I cut white cardstock using the Zen Coffee #2 Cover Plate and adhered to the background. 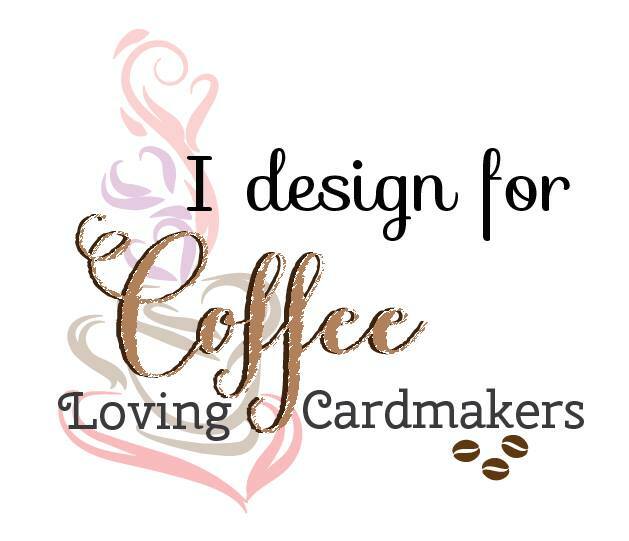 To finish, I cut the Coffee Fix Phrase die from dark brown cardstock. 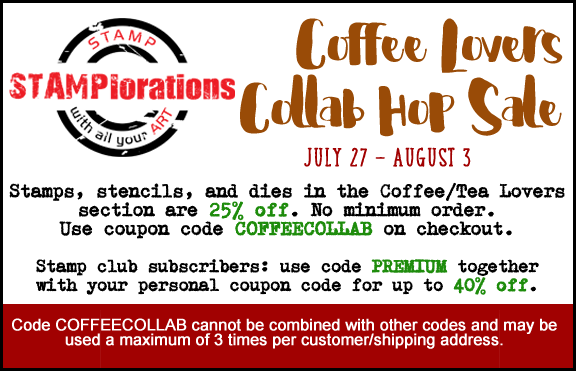 Enjoy 25% off all products in the Coffee/Tea Lovers section HERE! Way to show dual usage of the cover plate -- both turned out amazing! You are a MASTER with this cutplate! I am so starstruck right now. You are a STAR! Love the way you kept the dark brown pieces together to help you focus on the cup/steam. GENIUS! The other two cards are just as beautiful. Bravo! Beautiful cards, Kathy! I love the inlaid card...the colors are lovely. The watercolor card is so pretty. You have the different shades in just the right places. Both sentiment dies are such fun....going on my wish list! 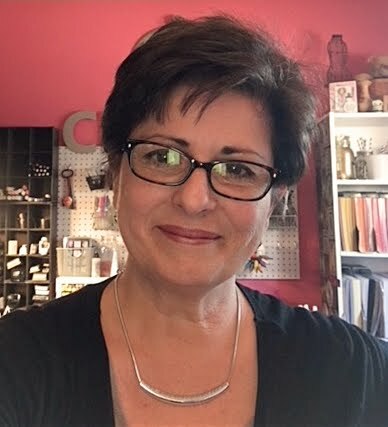 Oh Kathy, your projects are simply beautiful! 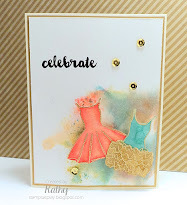 Love these beautiful cards, Kathy! The first one is my favorite!! I can't wait to receive this cover plate! I love that you can do the inlaid technique and get something so pretty (without coloring, which I don't do much of). Or, of course, you can color as beautifully as you did on the 2nd card. WOW your cards are so beautiful!! I love the colors on your first card and the inlaid technique is amazing! Thanks so much for these cards. I love them -- I am inspired! Such beautiful cards using that die and I know I would love to own it. WOW!! Both your cards are STUNNING!!! 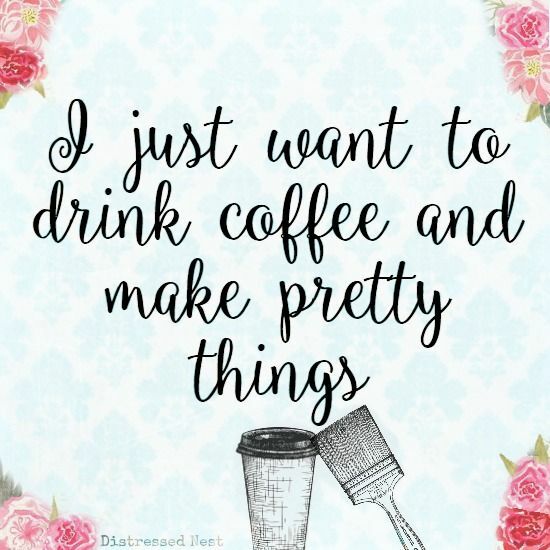 Beautifully Done Kathy - and oh oh I love that sentiment on card #2 - super duper correct - don't even talk to me until I have my first cup - hehehe Kidding - well---- maybe not! Have a blessed day! both are super cool--can't choose a fave! Sooooo pretty! Love that cool background behind your die cut panel! Gorgeous cards! I love the soft colors you used on the first one! I love how you inlaid the coffee bean designs with brown so they stand out. When I first saw this cover plate, I didn't even realize there were coffee beans as part of the pattern. These are gorgeous! How awesome your paper piecing is ... beautiful colors! And the oxide background... love it! 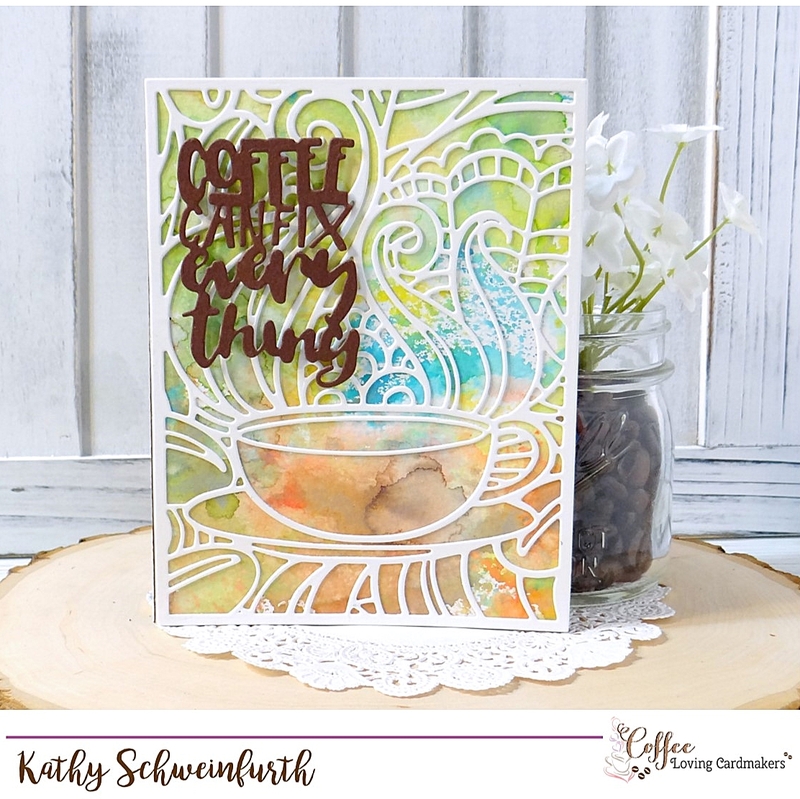 Your card with the Coffee Plate die is really gorgeous with all those paper-colours you have used Kathy. Distress as background also makes a lovely card. Absolutely gorgeous! 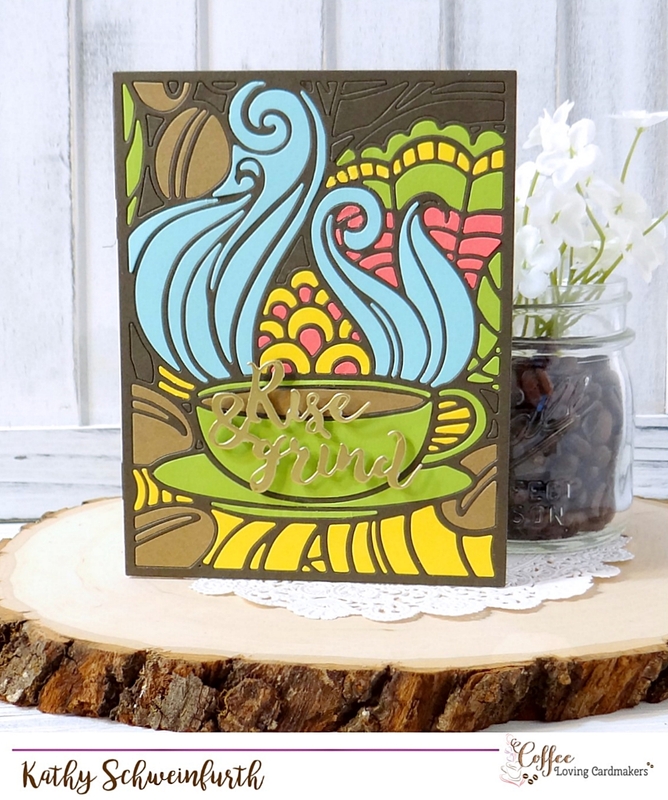 Love what you've done with this cover plate die! The first one is gorgeous but I love the second one and that beautiful background! Great sentiments too! jump off soon. Beautiful card. LOVE the variations with this coffee die! Wow, so beautiful. Kathy, these are awesome! I love your bright color combinations, which look amazing! Thanks for some great inspiration today! Both your cards are just beautiful!! I love the pretty colors so much!! Two fabulous cards! I love the sentiments on them both! Kathy, both cards are STUNNING!!! Love both backgrounds and designs. Thanks for the inspirations! Fantastic cards! Love the inlaid die technique! Wonderful cards! Love the paper piecing, such fantastic colors. The smooshed background is awesome for this die. Oh I really LOVE your two cards! I really like the inlaid die technique that you used for the first card and the different colors are just gorgeous for it too! 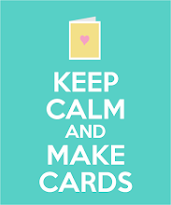 On your second card I really like your blend of oxide colors very nice looking!! These are glorious cards! I think the first is my fave, but I love them both! Beautiful cards! I love the versatility of this coverplate! so pretty, with all of those swirls! Fabulous cards! 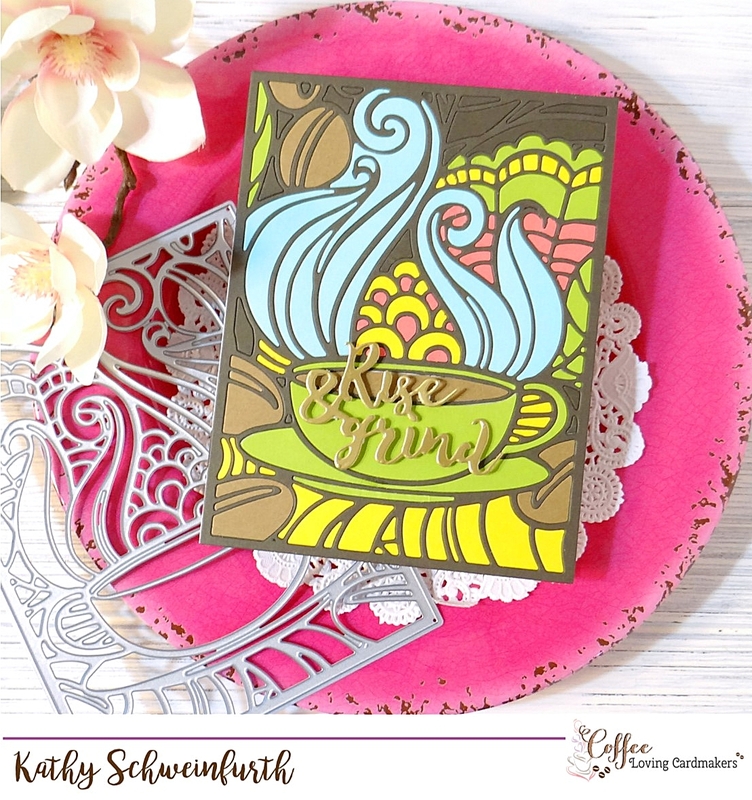 Love the cover plate designs and your pretty color combos! Beautiful cards!! I love the colors on both... beautifully designed! love, love, love this die! you did a fantastic job with it! Fabulous--I like your choice of colors. you never disappoint with your amazing creations!